The overall goal of the WU-PDTC is to exploit the translational potential of PDX models for evaluating the response of various treatments in models with specific molecular characteristics. As PDX models more faithfully reproduce human cancer than cell lines, they can contribute to the ultimate clinical implementation of cancer precision medicine. We have developed a large collection of PDX models across 12 major cancer types, including colorectal cancer, pancreatic cancer, breast cancer, melanoma, and sarcomas. A major goal of the WU-PDTC is to develop and characterize 1000 new models across common and rare cancer types that can be linked with the originating patient clinical response profile. The PDX models can be manipulated with functional studies to gain better insights into tumor biology and validate biomarkers. The ability to engraft and derive PDX models of rare tumors for which no cell lines are available, will allow for the development of therapies for orphan diseases. Finally, we will be able to identify how best to treat patients based on their underlying tumor biology through clinically annotated, genetically and proteomically characterized PDX models. 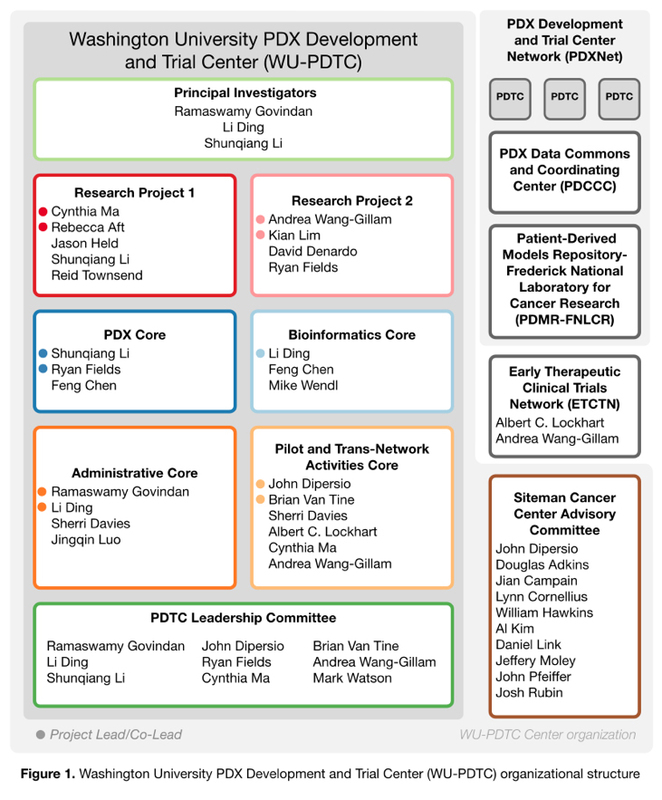 The WU-PDTC has extensive experience in analyzing genomic and proteomic data from PDX models. The Principal investigators Dr. Ding and Dr. Li, were the first to publish the whole genome sequencing and analysis of a PDX breast cancer model derived from both a patient’s primary and metastatic tumor in 20101. In 2013, we successfully proposed an investigation of the idea that when a new targeted drug enters clinical investigation, a “preclinical phase 2 trial” is initiated in the target population using patient-derived early passage xenograft (PDX) models annotated with comprehensive genomic, transcriptomic and proteomic information in our PDX program. We refer to these xenograft clinical trial studies as “Xenograft Phase 2 (XP2) Trials”. An XP2 study using PDX models to test drug response to endocrine therapy was published in Cell Reports in 20132. More recently, our group in collaboration with Dr. Steve Carr’s group at the Broad Institute, conducted proteogenomic characterization of 24 PDXs representing various subtypes of breast cancer and nominated prominent therapeutic targets in PI3K and HER2 pathways. Subsequent PDX trial experiments validated the proteogenomic findings3. Using our large panel of established PDX models, we are poised to initiate XP2 studies within our PDTC. The WU-PDTC is currently supporting two research projects using breast cancer and pancreatic cancer models to conduct XP2 trials that target key growth factor receptor signaling pathways. The first project focuses on identifying response predictors and resistance mechanisms for PI3K inhibitors (pan-or beta isoform specific) from the Cancer Therapy Evaluation Portfolio (CTEP) portfolio to use either as a single agent of in combination with a MEK inhibitor for the treatment of breast cancer. 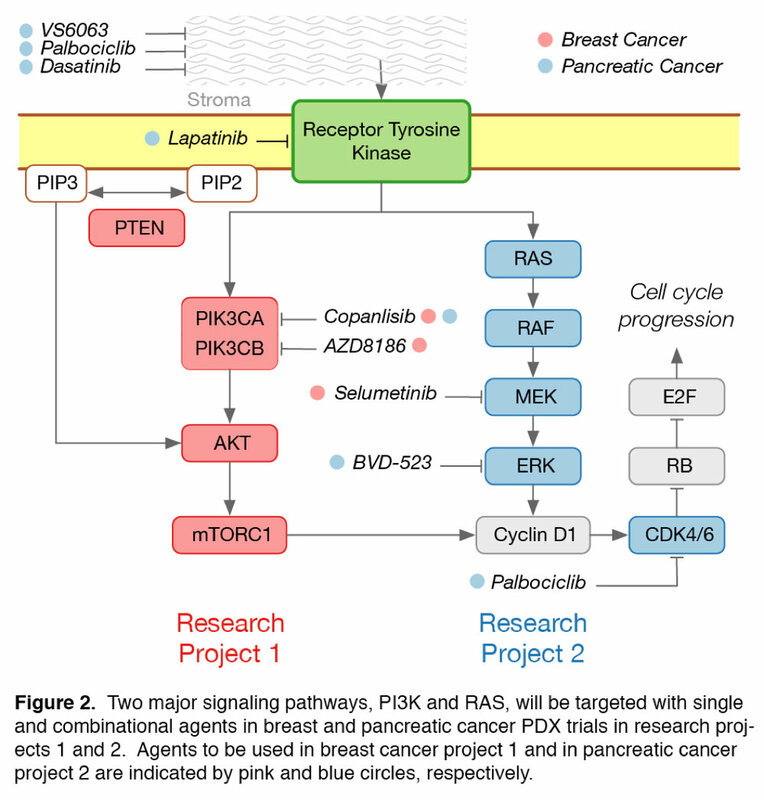 The pancreatic cancer project focuses on identifying the best partner drug for an ERK inhibitor, by targeting candidate pathways which include PI3K, HER1/2, and CDK4/6. Although the tumor types addressed in the two research projects are different, similar methodology in tumor assessment and informatics analysis will be used to identify predictive genoproteomic biomarkers of treatment response. Since crosstalk between biological pathways potentially exists in cancers of different histopathology, knowledge gained from one project could lead to new hypothesis testing in the other cancer types. The information from the PDX models will provide the preclinical justification for the development of two clinical trials. 1. Ding L, Ellis MJ, Li S, Larson DE, Chen K, Wallis JW, Harris CC, McLellan MD et al: Genome remodelling in a basal-like breast cancer metastasis and xenograft. Nature 2010, 464:999-1005. PMID: 20393555; PMCID: PMC2872544. 2. Li S, Shen D, Shao J, Crowder R, Liu W, Prat A, He X, Liu S et al: Endocrine-therapy-resistant ESR1 variants revealed by genomic characterization of breast-cancer-derived xenografts. Cell reports 2013, 4:1116-1130. PMID: 24055055; PMCID: PMC3881975. 3. Huang KL, Li S, Mertins P, Cao S, Gunawardena HP, Ruggles KV, Mani DR, Clauser KR et al: Proteogenomic integration reveals therapeutic targets in breast cancer xenografts. Nat Commun 2017, 8:14864. PMID: 28348404; PMCID: PMC5379071. For additional information on collaborating with WUSTL PDTC using their sarcoma PDX models in a supplemental project, please contact Dr. Brian Van Tine (bvantine@wustl.edu, 314.747.3096). For additional information on collaborating with WUSTL PDTC using their melanoma, colorectal, and pancreatic PDX models in a supplemental project, please contact Dr. Ryan Fields (rcfields@wustl.edu) or Jacque Mudd (jmudd@wustl.edu ). For additional information on collaborating with WUSTL PDTC using their breast cancer and all other PDX models in a supplemental project, please contact Dr. Shunqiang Li (sqli@wustl.edu) or Tina Primeau (tprimeau@wustl.edu ). This project has been funded in whole or in part with Federal funds from the National Cancer Institute, National Institutes of Health, Department of Health and Human Services, under Contract No. 1U54CA224083-01.